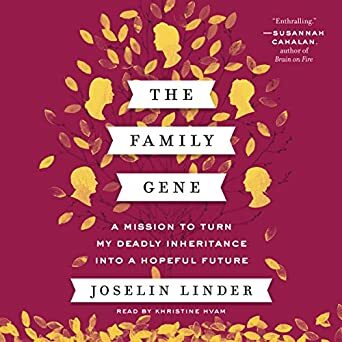 Joselin Linder tells the story of herself and her family who have an extremely rare genetic mutation that causes medical problems that lead to death. She starts out talking about her physician father's illness and death, which was alarming for the whole family. Then there's a retrospective look at previous deaths in their family that must have been due to the same problem. After this, Linder goes into her own life, talking about her college days, indulging in some drug use, her love life, and her rather meandering career in her twenties. Her life also involved her helping take care of her ailing father and the family repercussions of his death. So she tells the story of her father multiple times from different vantage points, which leads to some repetition. There's also some summary of genetic science and genetic medicine, which provides important background to understand the genetic mutation that causes so many problems for her family. Linder gives biographical sketches of both famous scientists and also some of the researchers who have worked on the gene mutation in her family, which adds some human elements to the dry scientific facts. So The Family Gene is an informative read, and an engrossing story. The performance of the unabridged audiobook by Kristine Hvam is energetic and appealing.